The term self-care gets bandied around a lot. I too am guilty of talking about self-care, and have written a few previous posts about self-care for mothers and why it's valuable and necessary. And whilst it's a concept with increasing usage, that doesn't diminish it's importance. Self-care is especially important when we are going through a time of significant change. Whether the change was wanted or unwanted, the need for self-care and self-compassion at these times is crucial. However, when we are not experiencing significant transition, self-care and making time for what that entails, can feel like effort we cannot justify. As busy mothers we can find lit self-care is a low priority. One of our most popular excuse is we just don’t have time. However, daily self-care need not require a large time commitment. Simply put, as busy mothers we can feel like taking and making time for self-care is a luxury. It just isn't our top priority. Looking after ourselves, and showing kindness and compassion to ourselves is great in theory, but in our full and extremely busy lives, we struggle to find and dedicate time to self-care. Whilst it is lovely to be able to take half a day, or a day, or even a whole weekend, to really care for ourselves, it's not always practical. Instead, taking a simpler approach, I am sure we can each find pockets of time during the day where we can reconnect and restore our energy levels. 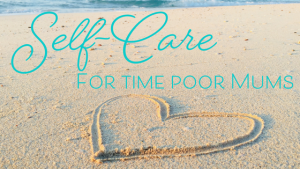 To help you out, (and to be honest, to help myself too), I pondered how could we obtain some of the many benefits of self-care but in a shorter timeframe. The timeframe that most of us could find and utilise without needing to completely overhaul our schedule, diary and/or life. (Note, sometimes a complete overhaul of our life is needed, and there is nothing wrong with that! But this post is for the time-poor who aren't quite ready to overhaul their life... yet). I've included below a list of ideas to get you started. Before you start, you might also like to consider these two important questions when coming up with your own list. What is good for my body? What brings my soul joy? Here is a list of self-care items that can be done in 2, 5 or 10 minutes. These are suggestions for when you have just a few minutes whilst the water boils for tonight's dinner, or when you are waiting in the queue for the check-out at supermarket. Or, best of all, when you find yourself with a few spare minutes between other commitments. Instead of scrolling through social media, try one of these ideas to get the most benefit from your precious few minutes. Mindfully rub a scented cream or lotion into your hands. Enjoy the scent and the tactile feeling of the lotion as it absorbs into your skin. Take a series of deep, calming breaths. Breathe in for the count of 3, hold it for the count of 3 and then breathe out for 3. Repeat. Light a scented candle. Enjoy the wafting fragrance and gaze into the flame. Move your body by doing some gentle stretching. As you stretch your muscles, feel the movement and increased blood flow reinvigorate your body. Complete a 5 minute meditation. Meditate either in silence on your own, or using a guided meditation. (There are many apps that provide free guided meditations to help. Try a few to find one you like). Get outside and walk on the grass. If your location and the weather permit, slip your shoes off and walk barefoot, enjoying the feeling of the blades of grass tickling your toes. List 3 things for which you are truly grateful. Write down these 3 things in a journal or notebook, or just think about them. Even thinking about what you are grateful for can boost your sense of well-being. Laugh. Watch a YouTube video or listen to a funny podcast - something you know will have you laughing out loud. And even better if it can be a true belly laugh. Humour is one of the best ways to lift our energy. Savour a hot cup of tea, or your beverage of choice. The key is in taking the time to savour it; truly taste the flavours and enjoy the experience. Take a 10 minute nap. A power nap has been proven to recharge your energy levels, and so is perfect when you need to show some care for yourself but have limited time. Start writing a bucket list. By dreaming of and planning things you want to do in the future, you are telling yourself that you value your own happiness, which is a form of self-love and self-care. Plus, as a bonus, after writing a bucket list, you will feel inspired and motivated. Call a loved one or friend to let them know you appreciate them. Sharing our appreciation for others boosts our sense of gratitude as well as enhancing the appreciation we have for ourselves. Plus, you'll connect with someone you love and help them feel better too! As you can see from the above suggestions, taking a few idle minutes and spending them actively doing something for yourself, could be a great way to boost your self-care habits. As mother's who are busy with work and family, as well as all the other commitments we have, giving ourselves a few minutes at various times of day could be a positive step towards finding time for self-care. I am not implying that small windows of time replace the need for larger portions of self-care time. Far from it. 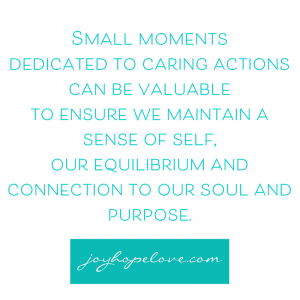 However, small moments dedicated to caring actions can be valuable to ensure we maintain a sense of self, our equilibrium and connection to our soul and purpose. And that sounds pretty good! And knowing I can give myself small snippets of self-care scattered throughout my busy day sounds great - especially to this time-poor mother. I love to support women as they identify and live their dreams - and I'd love to help you! Book in for your complimentary consult and we can chat about how we can work together.